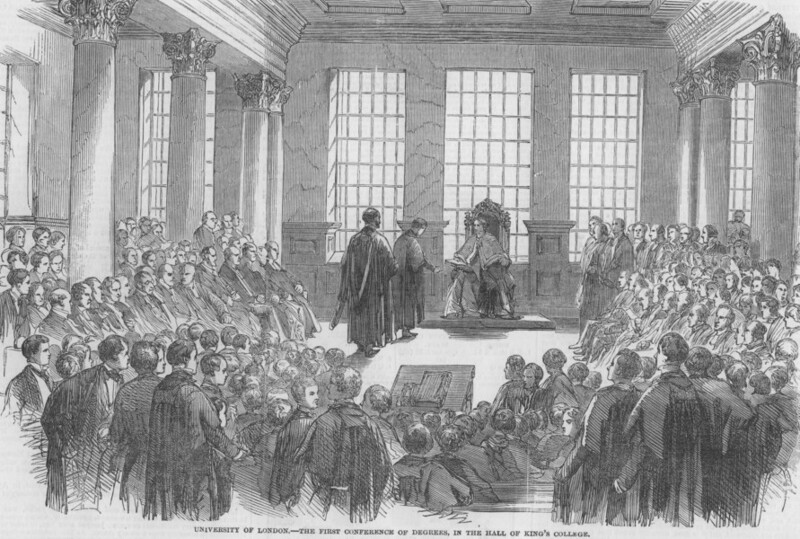 In our Journal of last week we reported, as fully as our limits would allow, the Convocation of the University held on the 1st instant, in the Great Hall of King's College, for the purpose of conferring degrees and honours on such candidates as had passed their examination during the twelve months just expired. We now engrave the very interesting scene—a memorable one, on account of this being the first time the ceremony has been performed in public. The Right Hon, the Earl of Burlington, Chancellor of the University, presided. The proceedings commenced with the reading of a short report by the Registrar, which stated that in the course of the last academical year her Majesty had been pleased to grant a supplemental charter, enlarging the powers previously conferred on the University. Her Majesty had also, by warrant under her sign-manual, been pleased to place in connexion with the University, in addition to the colleges and institutions previously authorized to issue certificates for degrees in arts and laws, the West of England Dissenters' Proprietary School at Taunton, and Saint Patrick's College at Thurles. During the past year, 167 gentlemen had been admitted to matriculation, of whom 11 had distinguished themselves when under examination for honours in mathematics and natural philosophy, and one had obtained an exhibition; and four had distinguished themselves in classics, one of whom had obtained an exhibition. 25 gentlemen had passed the first examination from the degree of Bachelor of Medicine, of whom one had obtained an exhibition in anatomy and physiology, another in chemistry, and a third in materia medica and pharmaceutical chemistry; several others had distinguished themselves, and obtained gold medals; 13 gentlemen had passed the examination for the degree of Bachelor of Medicine, of whom one had obtained a scholarship; two gentlemen had passed the examination for the degree of Bachelor of Laws, of whom one had distinguished himself in jurisprudence, and had obtained the University Law Scholarship; 53 gentlemen had passed the examination for the degree of Bachelor of Arts, two of whom had obtained the University Scholarships; seven gentlemen bad passed the examination for tie degree of Master of Arts; eight had obtained the degree of Doctor of Medicine, and one that of Doctor of Laws. The presentation for degrees then took place, each student being introduced to the Chancellor by the tutor of his own college. The presentation for honours and prizes came next in the order of proceedings. The names of all candidates who had obtained honours in the course of the past year ware read; but those gentlemen only who had gained scholarships, exhibitions, medals, and prizes were presented to the Chancellor. A deputation of graduates of the University then presented an address to the Chancellor and Senate, to which the Chancellor replied. The deputation then withdrew, and the proceedings terminated.